When tipster Taylor B. sent this photo in at 8:38 p.m., Feb. 14, 2012, he did two things wrong. First, he wrote, "Trust me, my mom thought this was actually a really sweet idea," and that's nothing but a preemptive strike. 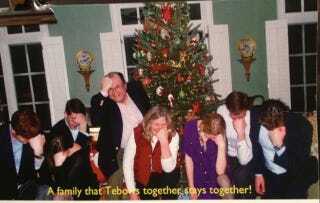 Second, the subject line of the email was "A family that Tebows together..."
Sure, the caption on the photo itself completes the sentence. But, his use of ellipsis is easily perceived as a challenge. To you. To finish that sentence any way you deem fit. So, do what you do best.